My dad loves sending me random emails about funny quotes, quizzes and trivia questions. Just to play along, I did one test, which involved rating my 4 favourite animals. I chose Pig, Cow, Sheep and Dog. Usually, one would choose the animals they want as a pet. But I chose the animals I wanted to eat (with the exception of dog). I love pork, followed closely by beef. Since we’re talking about pork, here’s what I ate over the weekend — the SS15 pork noodles at Restaurant Pomander. I usually get my pork noodle fix from Kean Fatt in SS3, but rif felt adventurous and decided to drive to Subang instead. 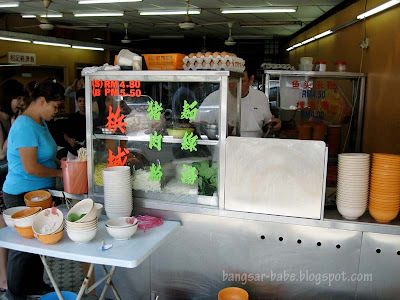 The noodles come in 3 sizes; small (RM4.50), large (RM5.50) and EXTRA large (RM6.50). You can opt to add an egg for RM0.50. rif and I did. Driving all the way to Subang was nothing, but having to wait 45mins for a bowl of noodles was a bit much. Each bowl of noodles is individually prepared, hence the long wait. If you’re so-hungry-until-you-want-to-chew-the-table, order the chee cheong fun (which isn’t good by the way) to pacify your stomach. Each time the helper carried a tray of noodles into the shop, I prayed and hoped it was mine. Alas, there was no point praying; I still got my noodles 45mins later. The noodles (you have a choice of kuay teow, yellow noodles and vermicelli) were delicious. Filled with minced pork, pork slices, liver slices, intestines and crispy pork lard, the broth had a sweet and flavourful porky taste. They must have boiled plenty of pork bones in the soup or added a lot of MSG, or both. Despite the slightly higher pricing, there was plenty of minced pork and lard. It was an incredibly satisfying meal. 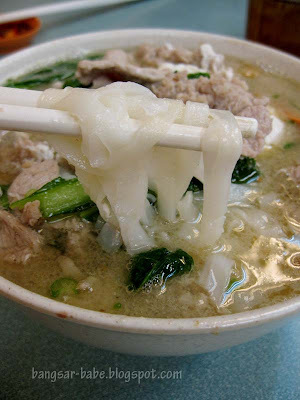 Verdict: A good bowl of pork noodles. Be prepared to wait. the wait is murdering i tell u..
i once ordered on the fone from my house when a friend was alr there..drove all the way from sg besi to subang thinking, crap my noodles will turn into mush by the time i arrive..
guess wat, still had to wait another 10-15 mins after i arrived!! 45 minutes girl! I salute you! All for a bowl of pork noodles! But you know what? I think I'd wait too! All in the name of good food, not to mention my love for pork noodles. Ooh can order by phone ahead?? Brilliant idea fr Joe, I think I might just do that! Any wait for more than 20 mins brings on muscle spasms! when u wanna bring me here to eat? the soup look very very good! Yap – I second that! TL – Aiks…I hate when that happens. KY – Yeah…I was told that too. 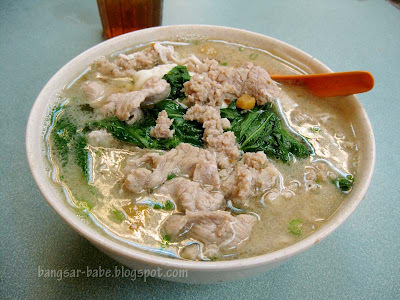 Ya hor…now that you mentioned it, there's no such pork noodles in Penang! Eric – You want to go everywhere! Plan first la. One by one! minchow – Hahaha…I didn't know can order ahead. I think I'll do that in future! I have searched 45 mins for this illusive place, garmin gps took me to the right place but there is no pomander. It has changed name, it is now called “Ooi noodle house” they retain the yellow colour though. They reply us very rudely you either wait or u can go. 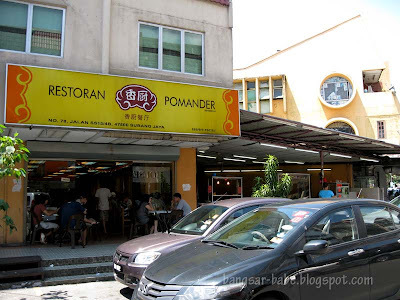 Where is the sister shop in sunway mentari?